NJ Paleo Girl: Pantry Raid!!!! I donated all of my nonperishable items to a local church. I know some of you may find this questionable (if I am not willing to eat it, why give it to someone else?). However, I believe that my Betty Crocker cake mixes, Stacy’s pita chips, and 100 Calorie snack bags are better in a churches kitchen for those less fortunate than in a dumpster. As I cleaned and purged I was able to reorganize and see everything I had. I had no need to buy spices- we are good on that front (I found 2 gigantic-- Costco size--- bottles of cinnamon- SCORE!). I found that I had cans of beets, pears, and oranges; I was able to use these as salad fixings for the next two weeks. I was also able to get my newly acquired almond flour, coconut oil, flax seed, coconut flour, coconut crème, and organic cocoa powder off the counters and into the appropriately organized cupboards (cooking/baking supplies)! I challenge you to purge your pantry: get rid of those evils lurking in the cupboards and replace them with healthy, paleo friendly alternatives! Don’t worry if it seems overwhelming, I’m here to help. With a clean, organized paleo pantry at your disposal, you can look forward to meals that will be fresher and tastier — and cooking will be easier and faster than ever before. With these four steps, you too can have a clean and organized paleo friendly pantry. Now that your pantry is completely empty, take this opportunity to vacuum any crumbs off of shelves and the floor. Then wipe down each shelf with a damp cloth (occasionally I will put some lavender essential oil on the cloth) and let dry before reloading. If you need to buy extra containers or organizers to corral items like spice jars, now is the time to do it. Finally, dust off or wipe down spice containers and cans (Don’t forget the bottoms of sticky jars.) Before you put anything back in the pantry, every item should be clean. With your kitchen pantry clean and sparkling, it’s time to put the food, and spices back. 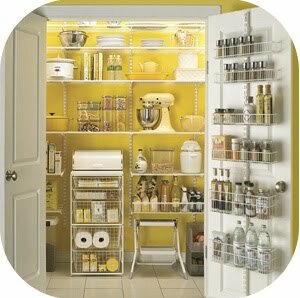 Refilling your pantry in organized zones is the best way to ensure you don’t have to do another pantry overhaul in a couple of months. Start by keeping like items together and put the items expiring first near the front so it will be the next one you pick up. Designate a shelf (or the right side of a shelf, for example) to spices. Keep another shelf for baking supplies, canned goods, and main course items (whatever categories of food you keep in your pantry). Separating food by type will help keep your pantry organized. Keep heavy items, like jugs of olive oil, on the bottom shelf, and the stuff you reach for every day (lunch ingredients, pet food) at eye level. Put sticky or spillable products (such as oil, honey, and baking powder) on a lazy Susan, which can contain messes, and because it can be taken out, it’s easier to clean than a cupboard shelf. Make sure flours, nuts, and seeds are sealed tightly. I have purchased special canisters to hold my flours and put a bay leaf in each one to ward off pests. Alternately you can store your flours in the freezer (My freezer is not big enough!). If you have kids, set up a snack zone, keeping snacks in sturdy, see-through baskets, so they can find what they need easily and don’t rifle through the other shelves. 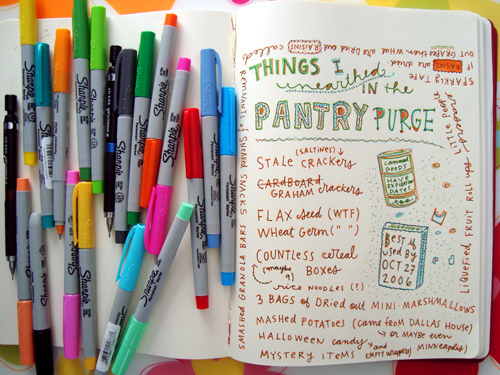 If you’re ultra organized and like to know at all times what you have post your pantry list on the inside of the pantry door. Finally, stash a stepstool in the pantry, if you have room, or nearby to make reaching high shelves easy. You’ll be amazed at how much time you can save by being able to locate something on the first try. Love this pantry, it looks so clean..
such a pantry is my dream!